As a caregiver you sacrifice a bit of yourself every day to care for your aging loved one and any product that can make your life easier is well worth the cost. Bed alarms give you the ability to move freely with the confidence that you will be alerted should the senior in your care get up or need you. Caring for a senior aging in place requires constant supervision, which can lead to stress and burnout for you as a caretaker. Selecting a bed alarm that meets your needs means that you do not need to sleep with one eye open or stand outside the bedroom door anymore. It means you can do your yardwork, run out to your car, or sit in the living room while your loved one is sleeping. This is peace of mind for you and we are happy to be here to help. Check out the reviews below. This alarm and bed pad work by setting off an alarm every time the person gets up from the bed. The system works exactly as you would want it to. This bed pad is a fantastic option for caregivers and seniors aging in place.. It works by triggering an alarm when the user gets out of bed. One of the key benefits that makes this bed alarm for elderly so great is that it doesn’t alarm at the site of the pad. This ensures that the user does not get startled because that could result in a fall. The alarm is wireless, accurate, and easy to clean and maintain. 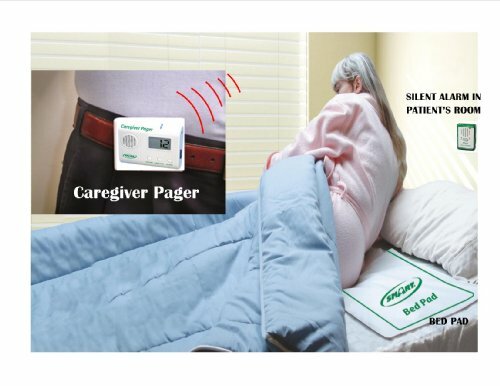 This caregiver pager functions a little differently by giving you mobility with your pager plus the pad lets you know when the person lays down as well. This alarm is similar to the previous, but includes a pager instead of a stationary alarm, giving the caretaker increased freedom and flexibility.. The pad also functions differently in that it beeps, letting the user themselves know that they have set it off. This provides confidence that the alarm is working, but it may be troubling for those who have had a stroke or have dementia. The pager notifies you when the user has gotten up and when they put weight on the pad, so you know that they are lying down once again. This floor mat functions as you would expect and alerts you every time you need to be. This floor pad provides a great alternative if you do not like the idea of having a mat in the bed. It works by triggering an alarm every time the user steps out of bed and onto the mat. The alarm is portable so you can keep it with you. The mat is highly sensitive, so the alarm sounds right away, giving you enough time to get there before the senior has a risk of falling. Set up is somewhat difficult and the instructions may not be entirely clear. This cordless bed alarm is a bit outdated but it functions as you would expect. The only downside is having to hold down the pager for four seconds to shut it off. 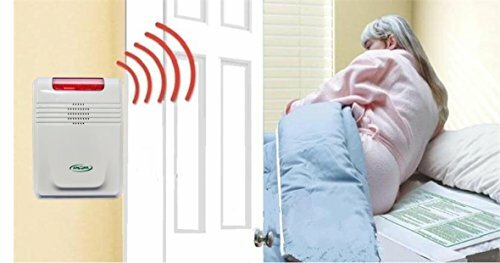 This bed alarm is ideal for seniors who want to continue living safely and confidently at home.. While the technology is a bit outdated compared to newer models, the functionality is the same. 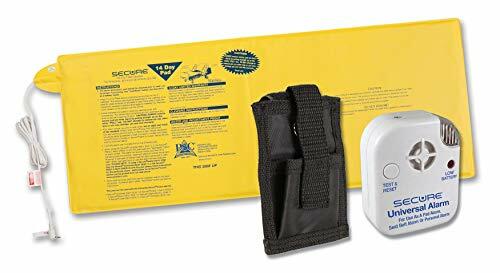 When the user takes their weight off of the bed pad, an alarm sounds at the location of the pager.The pager comes with a carrying case that allows the caretaker or family member present to move about freely and confidently. For this pager you have to hold in a button and wait four seconds for beeps until it stops. If the alarm is triggered, a button on the pager must be held down for four seconds to silence it.can become an issue if the user gets up quickly or if you are trying to disable the alarm quickly to avoid waking up other people in the room. The fall mat is an excellent choice if you want to maintain your independence as a caregiver. It allows you up to 300 feet away from the bed mat. This product is highly recommended for seniors. 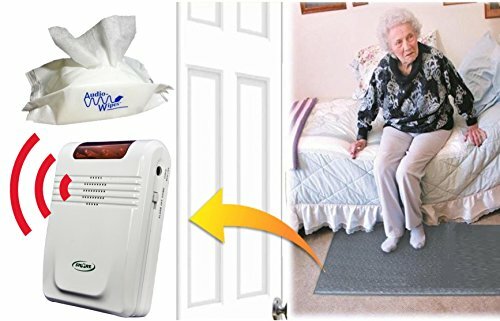 This floor mat helps prevent falls, injury, and wandering by sounding an alarm that alerts the caregiver when a user has left the bed or the room.The 300 foot range is ideal for in-home use giving you enough freedom to do what you need to do while caring for your loved one. When the user puts weight on the mat, it sets off the pager at your location. While the pager is convenient and gives you added mobility as the caregiver, we wish that the pager was small enough to fit in your pocket or had some way of being clipped onto your pants. This alarm is corded and requires you to be in a room near the person you are caring for. 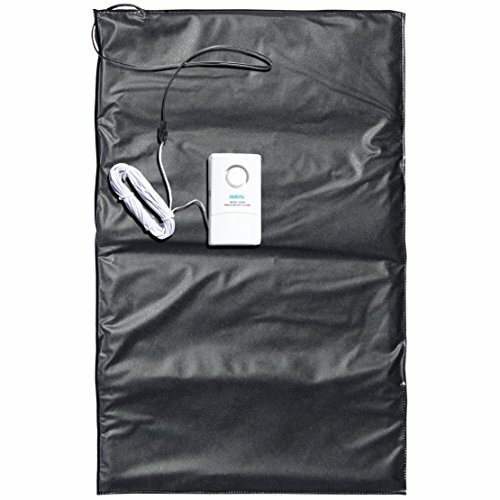 This pressure mat is a budget-friendly and effective option for seniors living at home. It is an effective way to keep users safe when wandering, dementia, and falling are concerns. wh Because it is a bit bulky and less attractive than some of the other options, this mat Is ideal for use under a door mat, bath mat, or rug. This mat is less convenient for caretakers as the pager is attached to the mat with a cord. Although the wire is extremely long, it’s definitely a hassle to have to run the wire all the way to your bedroom depending on your house. This would only work if the senior you are caring for is in the room right next to you. The overall design and feel of this product is somewhat cheap. W we did not have any negative experiences using the mat, it lacks durability and aesthetic qualities. We always recommend going with a cordless mat because having to run wires for no reason is too much of a hassle for us. With the variety of bed mats and floor pads available, it can be confusing and difficult to decide which one to choose. For seniors aging in place, it is essential to find a product that gives them the confidence to live safely at home. Whether an in-bed pad or a pressure sensitive floor mat best suits your needs, the information we’ve compiled should help you make the best decision. In most cases we recommend going with a wireless alarm because you do not want to sacrifice too much of your own independence to take care of your loved one. You want the freedom to be able to do all the things you are used to do while the user is in their bed. Having a corded alarm requires you to stay near them at all times. Even some of the longest cords do not reach further than one room away. The majority of products we reviewed were either a floor mat or a bed mat and both of them have their pros and cons. A floor mat does not get in the user’s way while sleeping, and depending on the person’s level of mobility, it decreases the chance of a false alarm. The bed mats tend to slide around, increasing the chance of a false alarm. Bed mats are a more inconspicuous option for seniors who may be sensitive to having a bed alarm at all. In cases where the alarm is independent of the pad or mat itself, the user benefits from the protection while never being disturbed by the alarm. Ultimately, you want to make the right decision, and there is no way to make the right decision without consulting the senior who will be using the device. If possible, talk with them and get their input on it. We understand that this is not applicable to everyone’s situation but if possible, let them tell you what they think works best and ensure them that you are only trying to help achieve their objective of aging in place safely. With the variety of bed alarms available to seniors and their caregivers, it can be confusing and difficult to decide which product to choose. It is essential to find a product that gives them the confidence to live safely at home while considering their preferences and space. Whether a bed pad or a pressure sensitive floor mat best suits your needs, the information we’ve compiled should help you make the best decision.